Flieger is the German word for pilot, or airman. 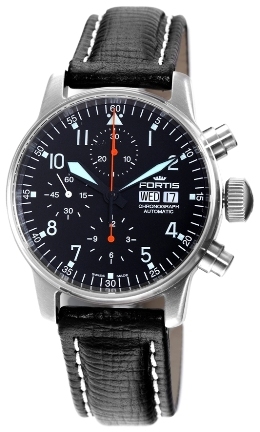 In English, the word “flieger” is commonly associated with pilot watches; this is, in part, because Germans were among the first to design pilot-centric watches for the civil aviation sector in the 1930s, but also because many of the definitive look-and-feel characteristics of modern pilot watches can be attributed to German manufacture. 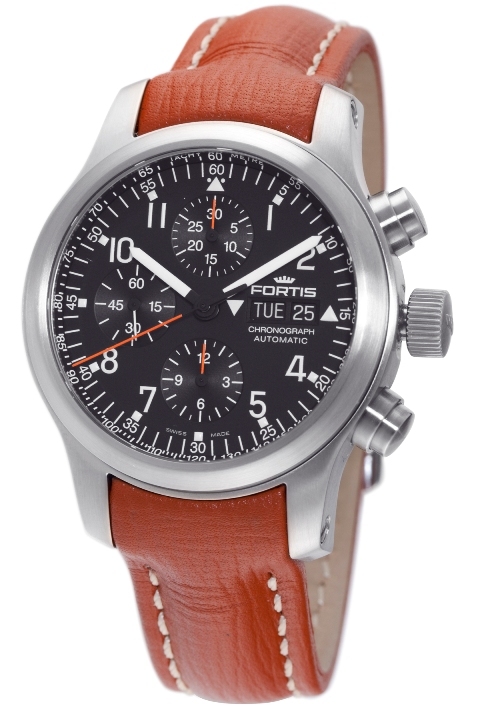 The Fortis Flieger Automatic Chronograph is a fine example of a modern airman’s watch. The two-part case is 40 mm in diameter and made from sandblasted stainless steel. The caseback is screw-down and stamped with the Fortis emblem. Scratch-resistant anti-reflective sapphire crystal covers the dial and allows for an ample view of the counters and hands thanks to the narrow bezel. A large knurled crown, stamped with the Fortis crown emblem, makes adjusting the watch effortless; the chronograph pushers are equally stout and straightforward to operate. In its day, the primary significance of the arrowhead index and flanking dots at 12 o’clock on the dial was to provide upward orientation of the dial during night flight. For pilots, it still does, and for non-pilots, the ubiquitous index appears as an essential design element. The black dial features Arabic numerals and indices coated with Super-LumiNova phosphorescent paint for excellent illumination in the dark. Luminous paint also appears on the sword-shaped hour and minute hands, whose relative thickness width-wise makes it easy to read the time over top of the sub-dials. Since function is the chief purpose of a pilot watch, the chronograph hands on the Fortis Flieger are all painted orange; this way the elapsed seconds, minutes and hours can be calculated with relative ease. The distinct positioning of the sub-dials suggests that this flieger contains a Valjoux 7750 movement, and indeed it does. The distinctive layout has the 12-hour counter at 6 o’clock, the 30-minute counter at 12 o’clock, and the continuous-seconds counter at 9 o’clock. Two apertures placed side by side at 3 o’clock display the day and date. 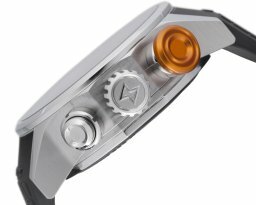 To accommodate the three-plate Valjoux 7750 movement, the case is 15 mm thick and water resistant to 330 feet. 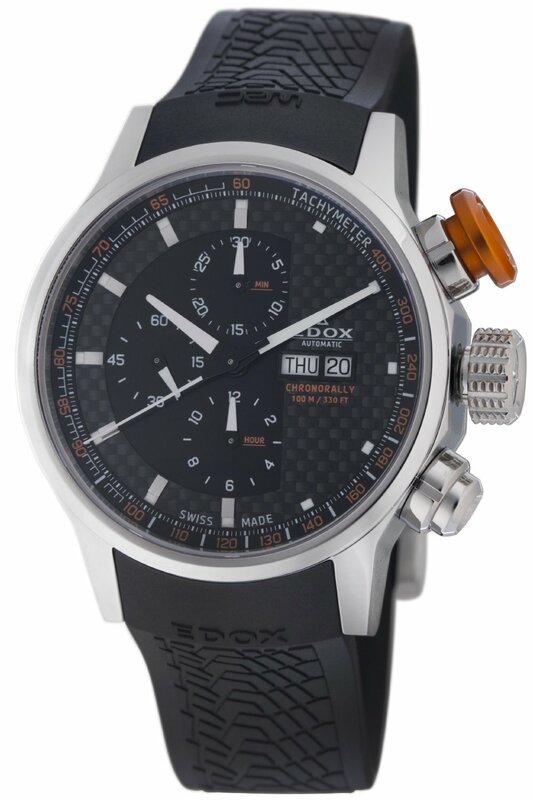 A complementary padded black leather strap with white stitching draws out the white-on-black contrast of the dial. The prong-style buckle is personalized with the Fortis emblem. The Fortis Flieger Automatic Chronograph won the inaugural European Watch Award back in 2004. 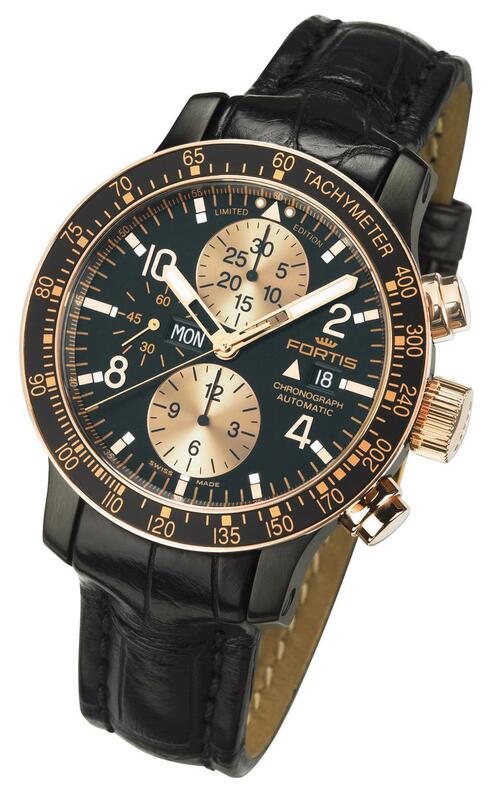 To acquire a Fortis pilot watch, contact an authorized Fortis dealer. One went into outer space. 100 more are now available for your wrist. The original Fortis Stratoliner chronograph has the distinction of being the first Fortis watch to be launched in space when it went into orbit in 1992 on board a Russian Proton rocket as one of the exhibits in the world’s first “space museum.” Even though the Stratoliner was never as popular as later Fortis space and aviation watches, this initial venture into space earned the watch a place in history and led to close cooperation between Fortis and the Russian space program. To this day, every Russian cosmonaut is presented with a Fortis Official Cosmonauts Chronograph when they complete their training at the Yuri Gagarin Space Center. 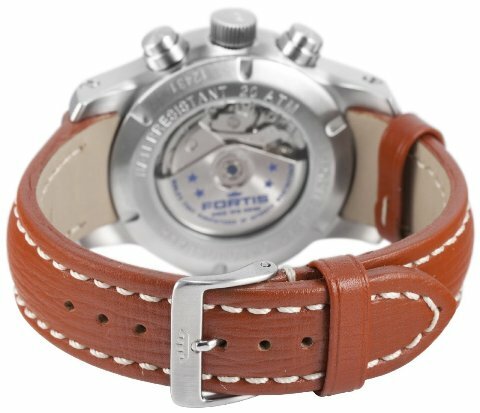 Early Fortis Stratoliner watches are prized by collectors today for their use of the legendary Lemania 5100 movement. This rugged movement could survive acceleration in excess of 7G without loss of accuracy and easily absorbed shocks and blows without stopping the chronograph second hand. When the 30 year old movement was discontinued in 2003, Fortis continued to manufacture the classic Stratoliner using an enhanced version of the reliable Valjoux 7750 chronograph movement. The Stratoliner never went out of production and eventually became part of the popular Fortis B-42 Collection. To commemorate the Stratoliner’s important place in space and aviation history, Fortis has recently introduced a special limited edition of the classic Stratoliner in celebration of the company’s 100th anniversary. This handsome 42mm timepiece features a dramatic black PVD coated stainless steel case that houses the Swiss made ETA Valjoux 7750 automatic movement. The black dial and retro looking black tachymeter bezel are enhanced with the use of 18 karat rose gold accents, along with gold plated hands. The watch is equipped with a scratch resistant sapphire crystal and two rose gold pushers and a gold crown complete the elegant look. Only 100 pieces of this exclusive limited edition timepiece will ever be produced. 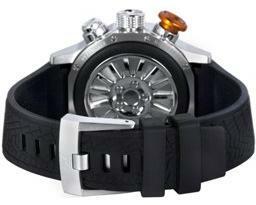 Each watch is water resistant to 200 meters and is fitted with a black leather or reptile strap. If you’re interested in acquiring a Fortis Stratoliner 100th Anniversary Limited Edition for yourself, you’ll want to act quickly. This exclusive edition is sure to be popular with collectors, so be sure to contact an authorized Fortis dealer immediately and reserve your Stratoliner today. 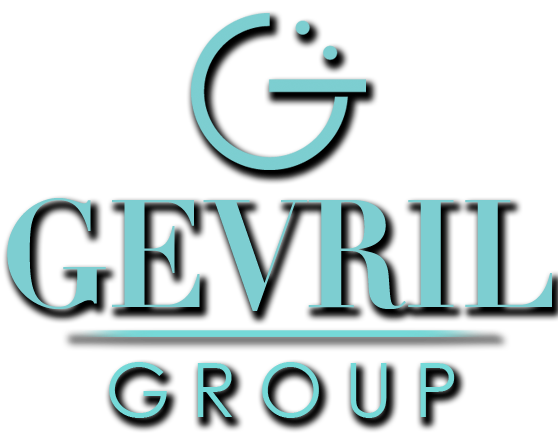 Gevril Group is the US and Canadian agent for Fortis Watches. Contact us by email or at 845-425-9882.